This post is meant to shed some light on the NMC process and how we're different from many other web firms out there. As a web design firm that works with dozens of political campaign websites, we've noticed candidates are already eager to gear up for the 2009 and 2010 cycles. This trend can probably be attributed to the campaigns witnessing the success of President Obama's online campaign. Over the past couple weeks, we've launched several online campaigns and had numerous others contract with us to begin building their sites. However, one recent campaign website stands out as unique among them, because of the way and speed with which the site was planned, designed, implemented, and launched. 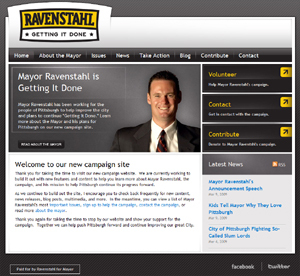 The site is for Pittsburgh Mayor Luke Ravenstahl, and the entire process took only seven days! We pride ourselves on our service philosophy and quick turnaround, but this site really takes the cake for speed and results. Much of the credit, however, is owed to the Ravenstahl campaign for their great feedback and timely deliver of necessary content. What's most striking is that this turnaround is not some unattainable goal, as many people believe. Much of the credit goes to the amazing campaign staff for helping out by getting us all the information and feedback we needed in a timely manner. Monday, March 13 - The campaign fills out our standard Creative Brief. The CB is the document that guides us through the creative process by giving us into the campaign's themes, aspirations, and ideas. The campaign answered all of the questions and got us the necessary materials such as their logo, candidate headshot and pictures. Wednesday, March 15 - We returned the first draft of the design to the client. Thanks to their great answers on the CB, we very nearly nailed it with the first draft. Thursday, March 16 - We work with the campaign to iterate on the design based on their feedback. Mostly small changes pertaining to minor layout and menu changes. We also draft the interior page design based on the latest iteration. Friday, March 17 - The campaign approves the design and we begin coding it onto our Content Management System. We code each of our sites in CSS onto our system, ensuring that the custom design is completely controlled by the CMS. Through the weekend - Our team worked over the weekend to finish the coding and get the site up on our test server by Monday morning. The campaign was awesome and sent us great content throughout the weekend, allowing us to load it into the site through the CMS as we tested across browsers and hooked up interactive features. Monday, March 20 - Final proofing by the campaign and we launch the site in time for the Mayor's noon announcement. The whole process took just seven days and we owe a lot of the credit to the campaign for being so helpful. The site has been well received so far. We plan on continuing to build out new features and the campaign will continue adding content through the CMS, but it's a great starting point for an important race. We were very excited when we were first selected to be involved with such an awesome race, and have only got more exhilirated as we've seen how truly awesome the campaign is to work with. In case you haven't already, be sure to check out the site. I hope you found this post interesting to learn more about our process and how we work with political campaigns around the world (we recently just signed our first two international clients, so we can now say that). Do you have any exciting launch stories of your own that you want to share? Do you have any ties to Pittsburgh?